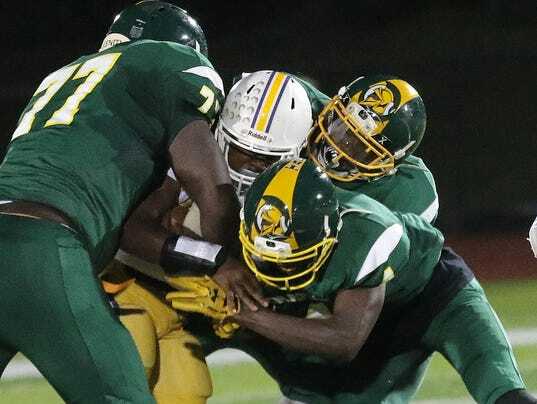 The Aiken Falcons went into Friday night with hopes of defeating the Taft Senators for the first time in school history. They came close, but ultimately fell short, losing 20-16. The Falcons got off to a fast start, with QB Tim Williams throwing a beautiful back-shoulder fade to Kievaughn Sanks on the first drive of the game. The march down the field took less than two minutes, and after the two-point conversion, Aiken found themselves with an eight point lead. Ater Taft and Aiken both had drives stall out, Taft managed to break through due to a mishandled punt from the Falcons on their own 5 yard line. Taft scored a couple plays later and would fail to convert on the attempt for two points. After an interception by Deshawn Lawrence, Taft took the ball back and marched down the field methodically, scoring an easy touchdown to take a 12-8 lead with seven minutes remaining in the first half of play. A couple interceptions later, we reached halftime with Taft still out in front. Both teams went into the locker rooms knowing they had to adjust and come back with high energy if they wanted to win the contest. A very defensive 3rd quarter went by quickly and eventually Aiken broke through. At the start of the 4th quarter, Aiken threw what looked like a quick bubble screen to Sanks in the slot, who appeared to be heading up the field, before he stopped on a dime and threw a gorgeous touch pass to Tim Williams who ended up taking it 66 yards and into the red zone. The Falcons ended up scoring 2 plays later and converted the 2-point try to make it a 16-12 ball game. Taft responded well by moving the ball down the field until they were abruptly stopped with a Falcons interception by the ultimate play-maker, Kievaughn Sanks. He would return the pick to the Taft 23 and it looked like Aiken had a chance to finally seal the game. Penalties proved to be the difference in the match-up as Aiken ended up being pushed back to mid-field before they had a punt blocked by the Senators that set Taft up with terrific field position. From there, the Senators ran between the tackles and forced their way into the end-zone, taking a 20-16 lead with five minutes remaining to play. Aiken would go three-and-out and the Falcons were unable to convert on 4th down, allowing the Senators to run the ball out and end the contest with a much needed victory! It was truly a collective effort for Taft, as many players stepped up to make critical plays at critical times. It was a very impressive showing on defense as well, as the Senators figured out a way to limit the deadly Aiken backfield of Williams and Sanks enough for a win. Aiken played a terrific football game and should keep their heads held high. They gave their rivals one heck of a game and should be proud for their efforts. And who knows, maybe we'll see these teams play again in November!